An Apology for Raymond Sebond is widely regarded as the greatest of Montaigne's essays: a supremely eloquent expression of Christian scepticism. An empassioned defence of Sebond's fifteenth-century treatise on natural theology, it was inspired by the deep crisis of personal melancholy that followed the death of Montaigne's own father in 1568, and explores contemporary Christianity in prose that is witty and frequently damning. 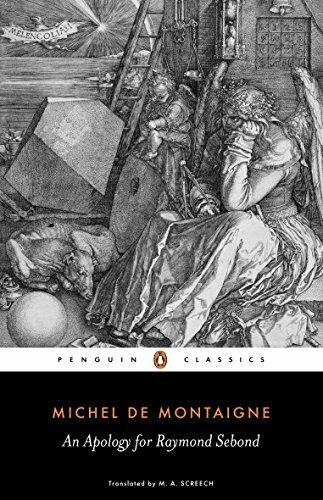 As he searches for the true meaning of faith, Montaigne is heavily critical of the arrogant tendency of mankind to create God in its own image, and offers his personal reflections on the true role of man, the need to eschew personal arrogance, and the vital importance of faith if we are to understand our place in the universe. Wise, perceptive and remarkably informed, this is one of the true masterpieces of the essay form. If you have any questions about this product by Penguin Classics, contact us by completing and submitting the form below. If you are looking for a specif part number, please include it with your message.